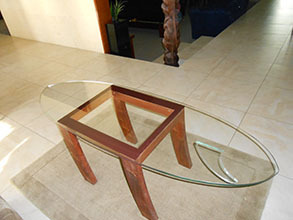 There are times when a standard piece of glass is either not the right size or not exactly what you are looking for. It is at these times that you require a custom-made piece of glass. 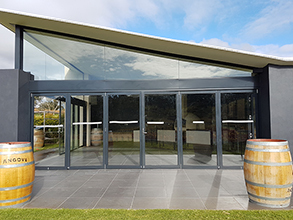 At McLaren Vale Glass we have a range of experience in working with clients and architects to design and manufacture unique, one-off glass. For west facing windows that heat up during the summer time you can choose an energy efficient glass. 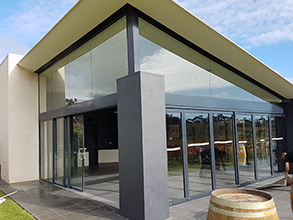 Choosing the right 'performance glazing' (energy efficient glass) lets you control how much heat enters or escapes from a building, which means your home stays cooler in summer and warmer in winter. This is not only great for your energy bills, but also prevents carpet and furniture from fading. There are several different shades of glass to choose from, such as clear, neutral, green, blue or grey glass. Choosing the right mirror for your bathroom will add style to your bathroom design. We supply and install an outstanding range of custom-made bathroom mirrors, that come with either polished or bevelled edges. Our bespoke mirrors are created to fit your needs precisely and so will complement your new bathroom fixtures and fitting perfectly. Our mirrors are all Australian-made triple coat mirrors that are notable not only for their strength and durability, but also their undeniable style. Building and want to use glass as a feature? 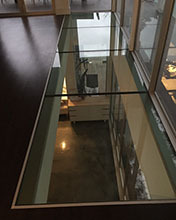 We work with high quality safety glass to give you that designer look. 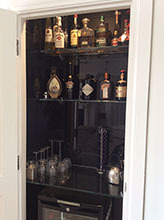 If you're looking for something a little out of the ordinary when it comes to glass talk to us. 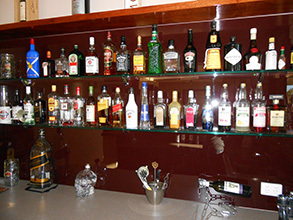 We have supplied glass for a range of projects for table tops, bars, cabinets, windows and more.